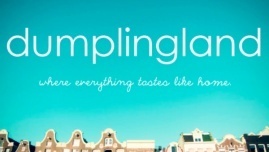 dumplingland is my imaginary fantasyland where family is near, potstickers are plentiful, and everyone bikes everywhere. the weather is always warm, even when it snows, and community sheepdogs roam the streets ready for a cuddle. there's a muffin shop, a garden, and a mandatory chocolate break every afternoon. at night, citizens gather in the town square for little concerts and deep conversation and bonfires.